Just on a lark, I searched for "flapper" on blockbuster online and the short film Under the Biltmore Clock came up starring Sean Young. It's an American Playhouse adaptation of the F. Scott Fitzgerald short story "Myra Meets His Family." Not being a huge Sean young fan I was pleasantly surprised at how well cast she is in her role as Myra and the delightful song and dance she does towards the end of the movie really clinched it for me. 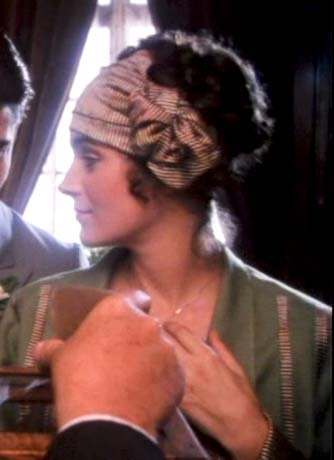 What I love best about this film is the wonderful hair accessories. I found myself waiting patiently for each new scene because Myra had a new wonderful matching ensemble. I am on my second rental of the movie and the fashion alone in the movie is moving me to buy it. It may not all be 100% period, but it is certainly imaginative and the extra care taken to match the accessory fabrics to the clothes, especially when matched to the lining materials, makes me love them. Don't be surprised if you see a line of Tart Deco headache bands soon. I am definitely inspired! Have you ever been looking for just the right fabric for a sewing project and couldn't find it for the life of you? Well, Spoonflower has changed everything by allowing people to upload their own designs to print custom fabric. Yes, it is a bit more expensive at $18-27 a yard, but there are ways to get 10% designer discounts. You can also shop other people's designs. Plus, they have design contests where you can win $100 credit, plus you always get 10% of any of your designs that sell. P.S. I haven't tried them personally, but they offer several different fabric choices and you can buy swatches and fat quarters at a much lower price. 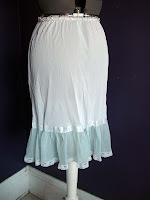 You can also see a video of completed fabric here (skim forward to 4:30 on the video) and they have a blog that has posts that cover pretty much any question you may have. I never really cared about history growing up. I know- gasp! Okay, it's not completely true- I cared about music history, but not in the sense that I was connected to it or wanted to recreate it as a lifestyle. It wasn't until I started performing at a local renaissance faire that I started to put two and two together and understand how wonderful (and fun) it is to immerse myself in an historical lifestyle, especially sewing the fashions. After 12 years at Bristol Ren Faire, I moved on to other time periods through friends who did reenacting. I first got into the 40s, which is how I met my husband. I quickly moved into the 50s and rockabilly music, which is part of the reason I started this blog. I was lucky enough to have some friends who really knew their stuff to help me out when I first got started, but I also began to put together my own reference collection. 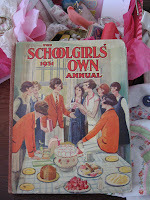 Having the right books, magazines, music and online links have helped me immensely, so I thought I would start to highlight some of them in case anyone else would like to start their own library. I will be tagging these posts as Vintage Library. Guess what? She's coming out with a new book on twenties fashions and you can pre-order it for 32% off. I already ordered mine! Dancestore.com has these AH-dorable blue gabardine sailor pants for $34.95 in plus-sizes! 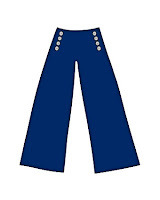 The natural waist sizes run from 23-37" (although the pants do sit a bit lower than that so they technically run at 26.5-39"). You can see all of the measurements on the item page. 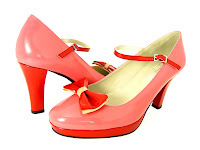 This site also has tons of reproduction Aris Allen dance shoes at decent prices. 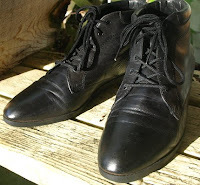 I have been known to buy a dance shoe on sale and add a rubber sole on the heel for everyday use. BTW, they have knit snoods for $5 in 7 colors, like black, red and gold. 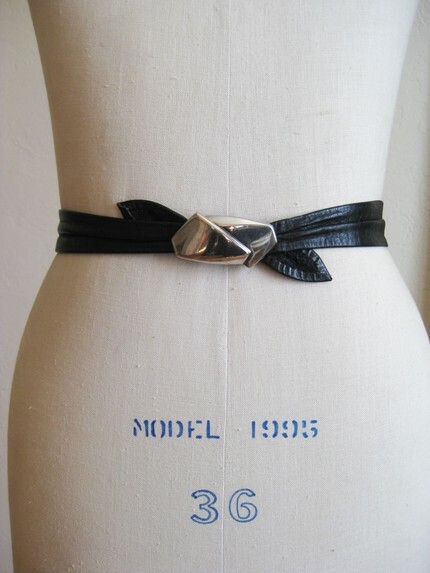 Grosgrain blog has done it again with this cute vintage-inspired belt giveaway. If you want to win one of these cuties (available in other colors) visit the link above. 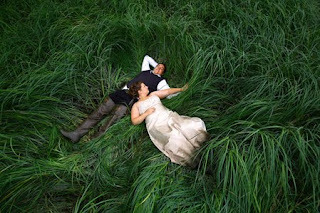 Did you know that the average wedding emits approximately 14.5 tons of CO2? While the average person emits 12 tons in an entire year (Source: Climate Care). PreownedWeddingDresses.com is giving away a few eco-friendly items if you are a fan on their facebook page, including a gift certificate for a "green" wedding dress cleaning. Excellent vintage condition. No problems. Nearly new. Chest-Armpit to Armpit - 21-1/2"
Back Length from shoulder top to waist - 17-1/2"
Back Length from waist to hem - 26"
Shoulder Width - 16" to 17"
I've had a few people comment and ask me about the basket swaps I posted about recently. 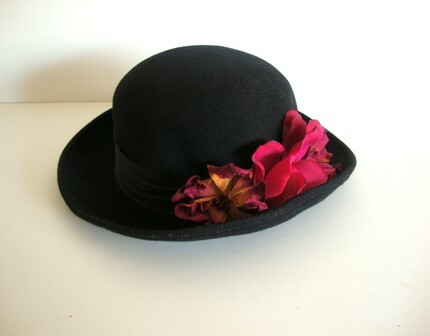 Just curious- how many of you would be interested in participating in a vintage millinery/flower swap if I hosted it? If you are like me, I tend to buy my millinery in bulk or take them off of damaged hats, so I have a lot in the same colors or styles. I thought it might be neat to mix it up and swap with others to refresh my stash and help others to refresh theirs. 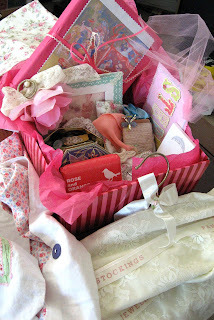 We could even open it up to include vintage sewing trims (like ribbon). Leave a comment if you are interested and if you'd like to include vintage trims or just do vintage millinery/flowers. The swap would start once I can get enough people (at least 3-4). One of my favorite sewing blogs is called Grosgrain. 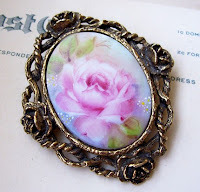 If you are a loyal reader you will notice that I post occasional giveaways from the blog that have a vintage bent. Well, I love the blog author's style and she just posted a list of her favorite sewing shortcut links! 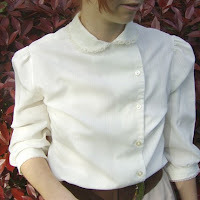 My fav is how to sew on a button using a sewing machine. 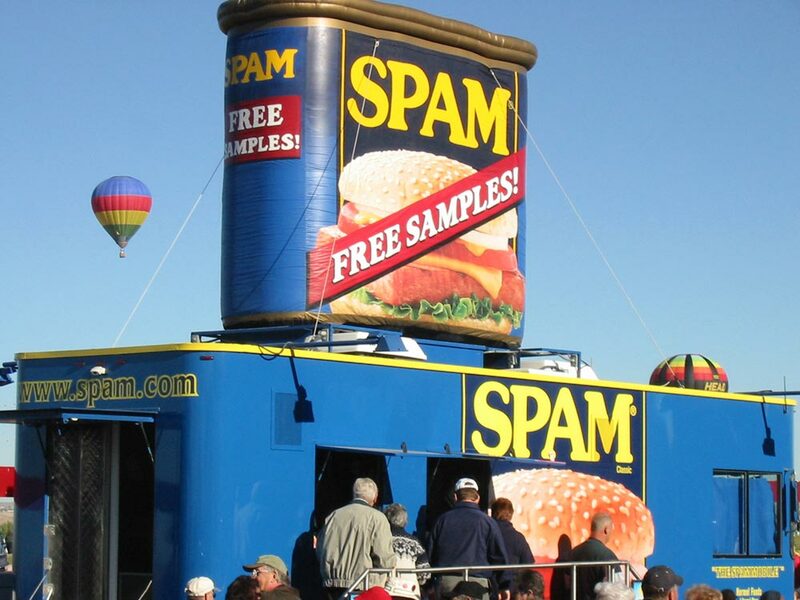 In the past month I have been swamped with spam comments, even with using word verification. So unfortunately I have to start moderating comments because it is such a pain to have to go back and hunt these comments down. I check my blog a few times a day so it won't be too long of a wait. Sorry for the inconvenience! My very crafty blog friend Brittany at Va-Voom Vintage Blog has posted a step-by-step how-to for refilling a vintage lipstick holder with modern lipstick. Brilliant! You may not be able to make it all out, but I got such lovelies such as a vintage tin full of vintage buttons, an art deco rhinestone buckle, a 1931 girl's schoolbook and, my favorite, a shabby chic framed art deco print. Number seven blog specials! This will be the last set of specials for at least a week until I can get more items ready and take pictures. These blog prices are 30-50% less than what they will be listed as on etsy later. Remember the rules I posted earlier, you have 3 days from posting to contact me to reserve the items at the blog price. After that they get added to my etsy shop at a higher, permanent price. As always, click on the pictures for a larger, more detailed view. 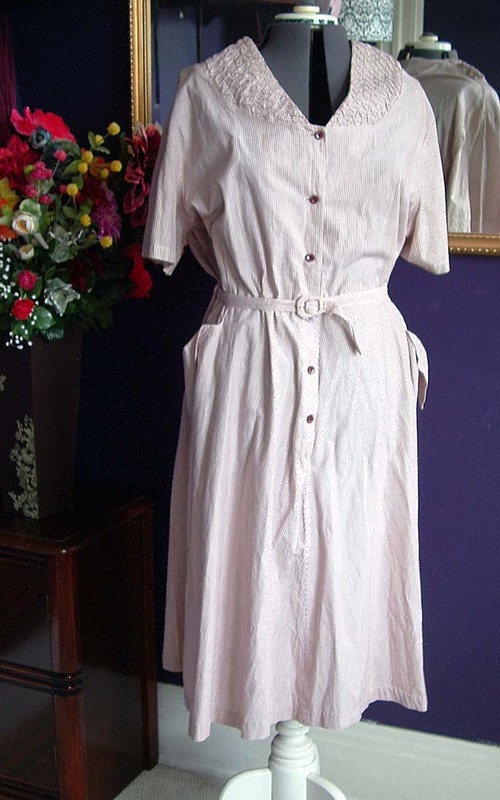 Gorgeous lo label matching linen dress and coat set. The straight a-line dress is unlined but the inside is slightly slick (almost like silk). I pinned the dress slightly on the mannequin to show the intended look. 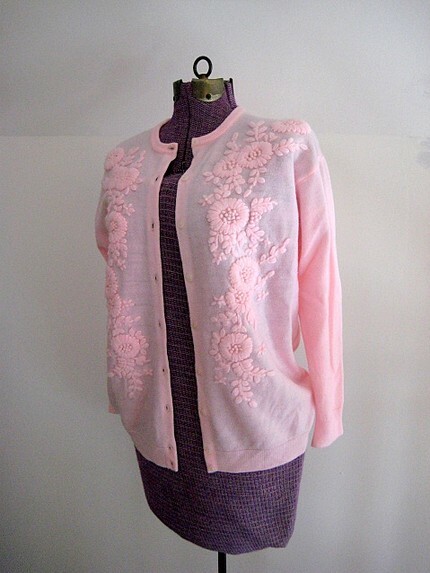 The swing-style coat is lined and has 3 fabric-covered buttons at the neck and is slightly shorter than the dress. The set is in excellent condition. I purchased it for myself and couldn't bear to cut into it to make it smaller. 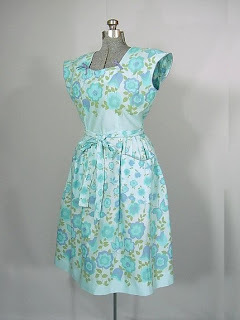 Cute apron from the 50s or 60s with one pocket in good condition. There is a small stain on the apron that I believe may be a rust or red wine stain (see picture). 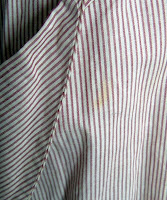 I hand washed the apron, but the stain remains. Perhaps some oxy-clean directly on the spot would lighten it, but the print is busy enough that it isn't very noticeable. Tart Deco original made with glittered clay flowers and clay leaves, with white baby's breath and peacock wisps peeking out. 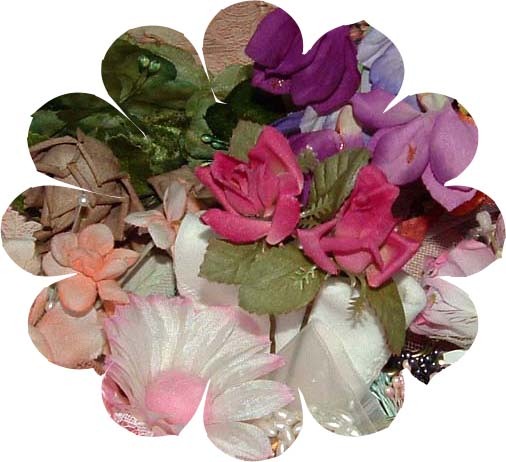 There is a small sprig of burgundy flowers underneath the large clay flower. This piece is definitely one-of-a-kind and sure to add a feminine touch to your everyday wardrobe. This slip is like something right out of Cat on a Hot Tin Roof with its lace detail on the bust, with a light chiffon-like nylon overlay and lace trim on the hem. The straps have metal adjusters. The full-length view is a little washed out from the sun so please view the close-up for a better idea of the color. Neat plus-sized 60s day dress made for having fun! There is a metal zipper down the front which works great. The dress is in excellent shape and ready to wear! So, that's group #7. You have until April 15th midnight, central time, to contact me to claim any of these goodies. First come, first serve and you may claim as many as you'd like (I will combine shipping for multiple items). Just remember that you have to pay within 3 days of your reserve listing or you lose the blog price, as per my posted instructions. 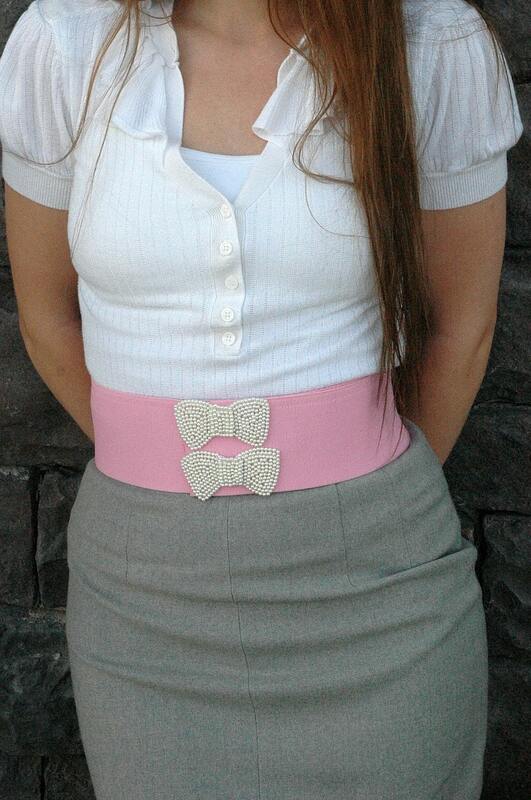 In keeping with my I Love Pink blog post, I have been craving to watch the 80s movie Pretty in Pink lately. 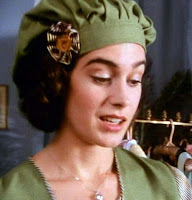 I remember seeing this movie in the theater when I was in high school and immediately going out to buy a long, straight floral skirt and black hat with flowers. I raided my dad's closet for suit coats (which is hilarious because he's a pretty big guy and I was swimming in them). 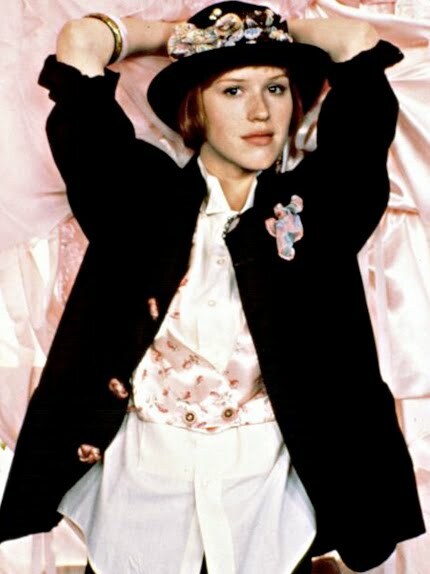 Molly Ringwald's character Andie had a profound effect on me and my lifelong wish to be able to create new things from old things. Anyone who has seen the movie remembers the scene where she makes her prom dress. I wasn't a huge fan of the final result of her sewing frenzy, but I still was thoroughly enthralled that she could do it. Years later when I learned how to sew all I wanted to do was repurpose damaged vintage. Today I do just that with my hair accessories. The fashion in this movie is what I remember most from growing up. Yes, there was the neon pink and green, legwarmers and weird leotard thingies, but this uber-soft, feminine vintage look has stayed with me til this very day. So there you go. Everything you need to be Pretty in Pink. If you haven't seen the movie, rent it asap. Or better yet, buy the new Everything's Ducky special edition dvd. Labels: fashion, Tart Deco, vintage repurposing, What's on Sale? 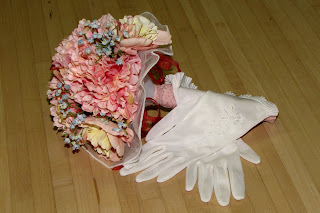 Here is the fifth set of items at a special blog price to my readers. These blog prices are 30-50% less than what they will be listed as on etsy later. 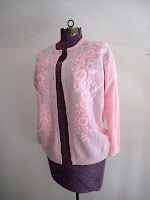 Remember the rules I posted earlier, you have 3 days from posting to contact me to reserve the items at the blog price. After that they get added to my etsy shop at a higher, permanent price. As always, click on the pictures for a larger, more detailed view. Plus size vintage dress in good shape. No label, probably homemade, with 2 petal pockets at the waist and a matching fabric belt. There are 2 small issues: a few stitches have pulled out in the left side smocking (on the chest). The smocking is intact, but it should be re-tacked before washing so the smocking doesn't flatten. 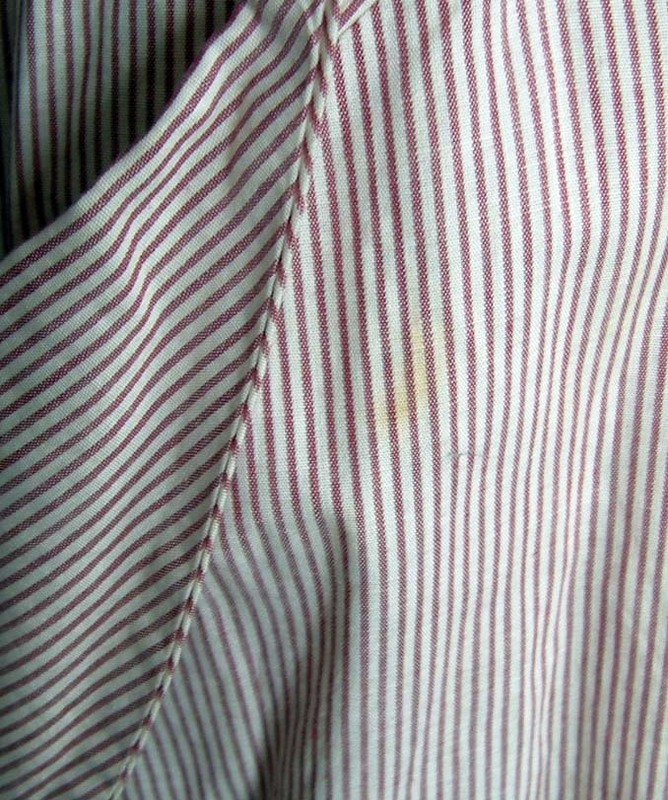 Also there is a faint stain near one of the pockets (see picture). I had to darken the photo so it could be seen better, that is how faint it is. Otherwise the dress is fine and in very wearable condition. 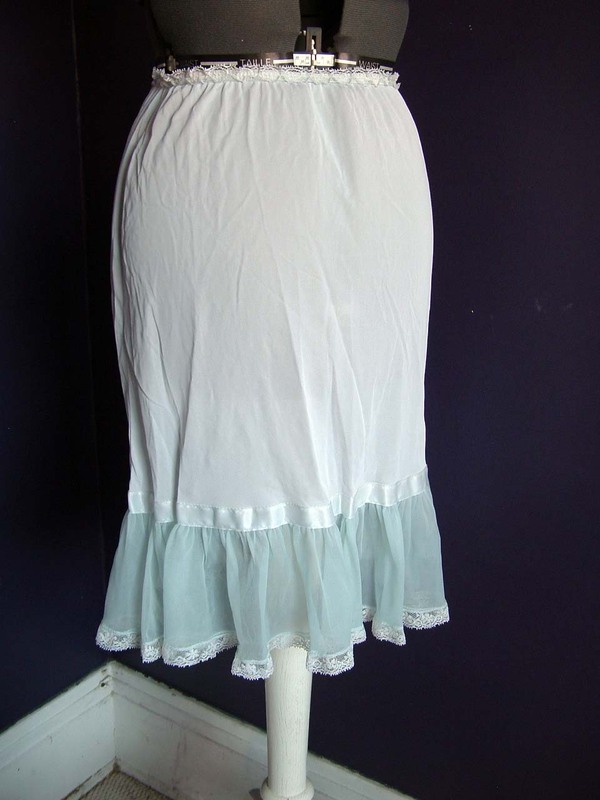 Adorable baby blue nylon vintage half slip with chiffon-like ruffle at the bottom. Label says "Avian small short." Great shape and ready to wear. 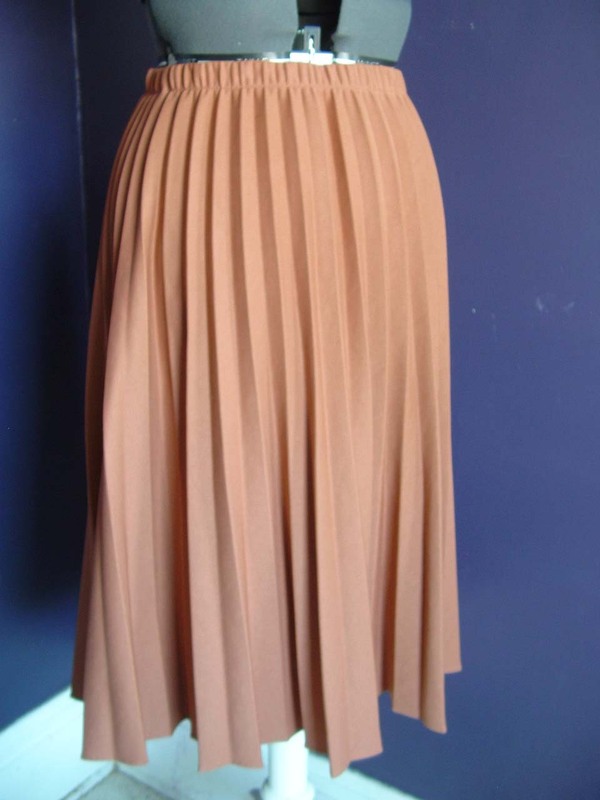 70s accordion pleated Fortrel polyester skirt, new with the tag still stitched into the waistband. The tag says "Knits by Steven Wayne" and is roughly mid-calf length. 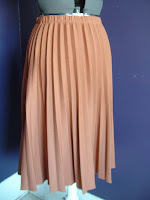 Very similar to a tennis skirt and just screaming to be paired with a cream cashmere sweater, don't you think? 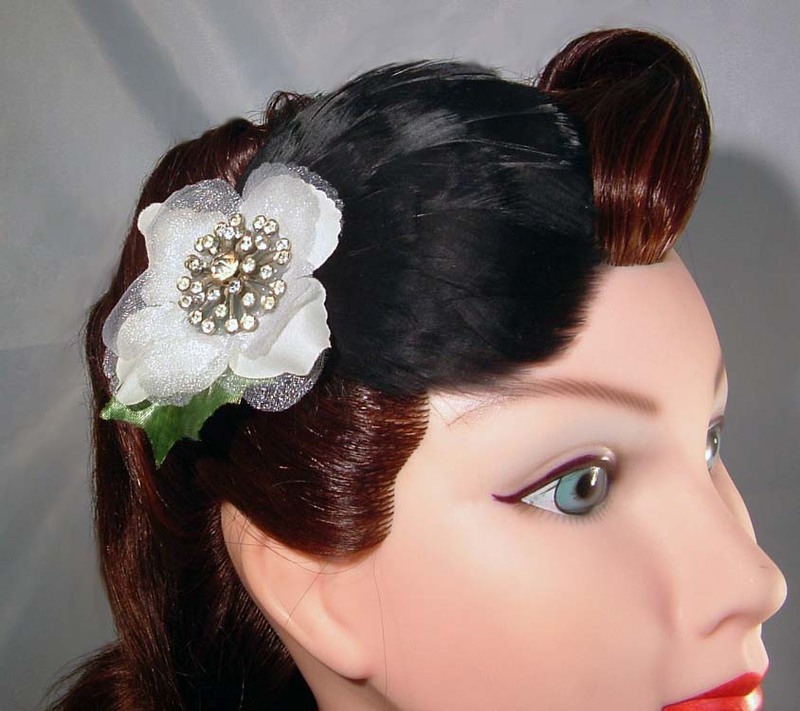 A white rose is opened and adorned with a vintage rhinestone center, nestled next to a black vintage 40s feather pad from Germany. All are attached to a large salon clip for easy placement. So, that's group #6. You have until April 9th midnight, central time, to contact me to claim any of these goodies. First come, first serve and you may claim as many as you'd like (I will combine shipping for multiple items). Just remember that you have to pay within 3 days of your reserve listing or you lose the blog price, as per my posted instructions. 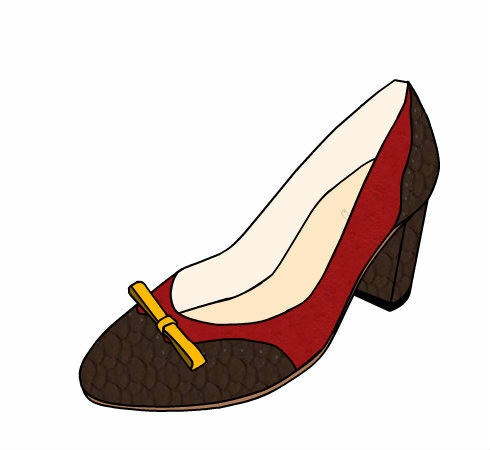 I found this awesome online shoe designer for vintage style shoes on the Shoes of Prey website. You can choose from 6 different show styles and modify the toes, heels, decoration, material and colors. It's SO fun! 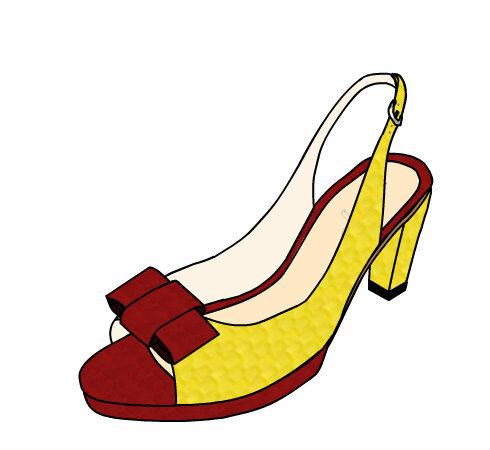 Here's the best part- you can buy the shoes you've designed. Of course, we are talking about $180-280 shoes, but hey- you get exactly what you want. Plus, they offer a full refund or exchange if you are unhappy with the shoes once they arrive. Or if they aren't the right size, they will resize them for free. They have a page dedicated to explaining how the shoes are made, which is kind of neat to read. They also have a facebook page, if you are interested in that kind of thing. Most of all, go to the designer and play! Holy Moly Batman! The Lingerie Addict is having a Kiss Me Deadly giveaway to celebrate her 2nd year blog anniversary. 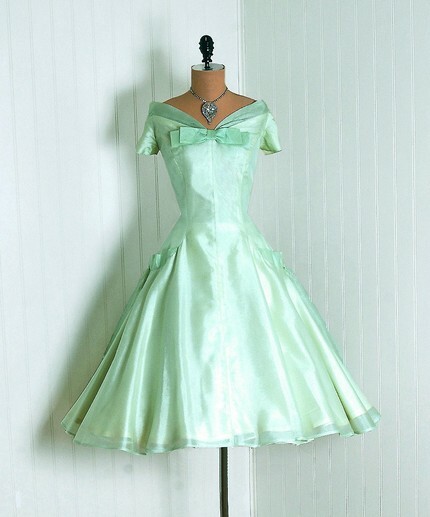 I have been drooling over Kiss Me Deadly's vintage inspired goodies for a while now. While I am on the subject of favorites, I have a favorite shop on etsy that I think carries some of the cutest stuff out there- Flapperdashery. 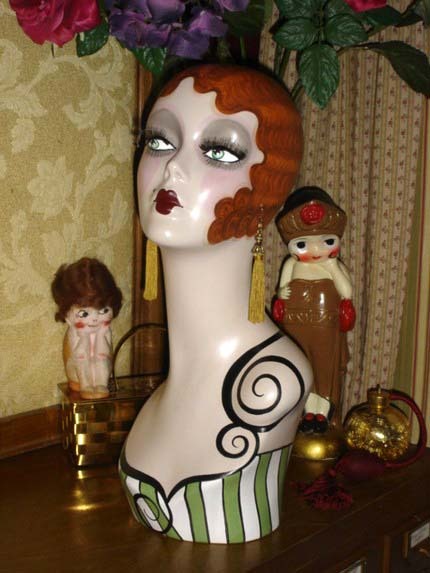 I found this shop while searching for a mannequin head to display my hair accessories and fell IN LOVE with her painted flapper mannequins. 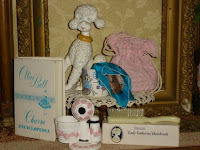 Finally, she has a few choice vintage items to round out her shop. 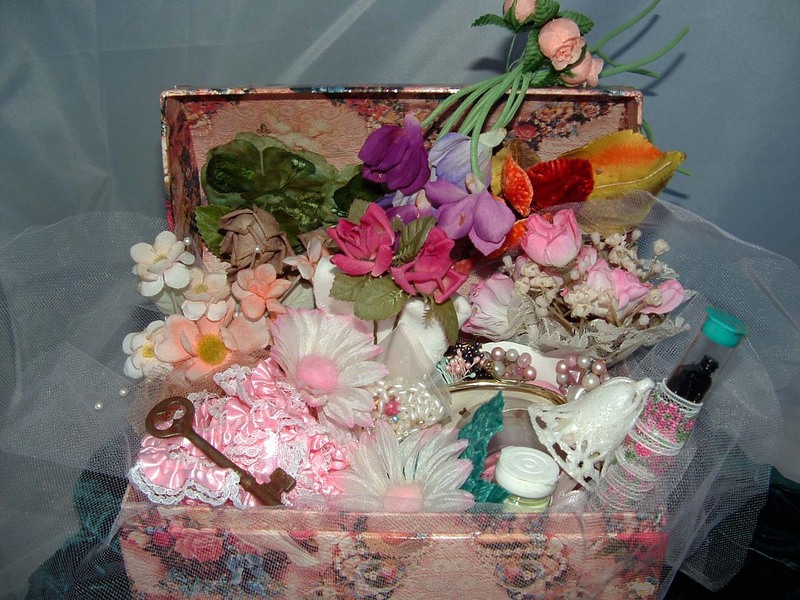 My favorite right now is this Vintage Debutante Kit for $22. LOVE the poodle and charm encyclopedia (signed by the author no less). Isn't this shop adorable? I think so. I am saving up for a flapper bust right now! 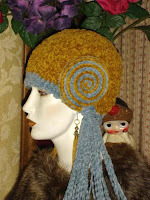 Labels: 20s 30s Flapper, Blog Spotlight, What's on Sale? 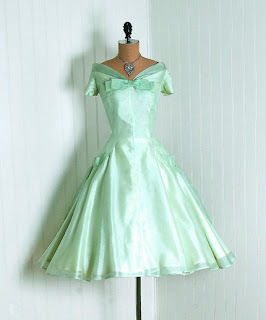 I know I just said I love pink, but this vintage mint green party dress from TimelessVixen is AH-mazing!! Seriously, I'm drooling on my keyboard. AND it's plus size (44 bust, 33, waist). Oh if I only had $350 to spare... anyone need a kidney? Vintage brides, this dress is a steal for a wedding gown and soooo unique. EDIT: It's no surprise that this dress sold already, but if you are interested, there is a plus size wiggle dress for sale in their store with the same bust measurements. No, not the singer, the color! Pink is one of those colors that I am surprised at loving so much in my adulthood. Even though my wedding colors were white and red, I still had a pink bouquet (pic on the left). It's not even what it represents, I just love the color itself; all shades of it. Funny enough, pinke originally referred to a yellow tint. Eventually, the color pink as we know it was considered a masculine color, and blue feminine, until the 1940s when it was reversed. and then fierce and daring! 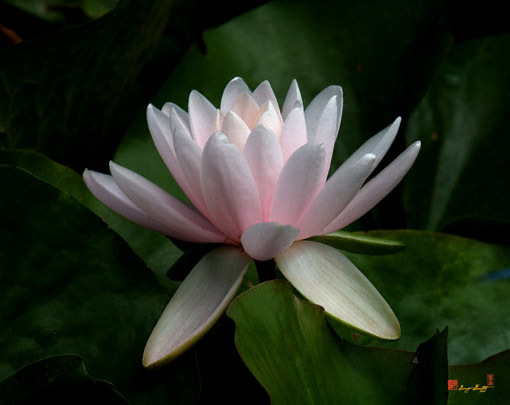 What color do you find yourself secretly loving and why?